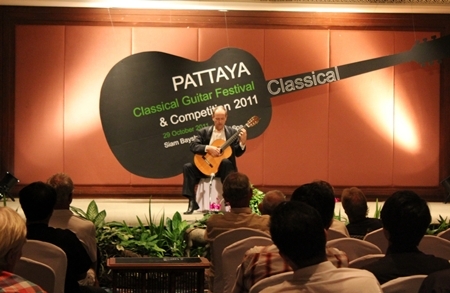 The Siam Bayshore Resort & Spa was the venue for the third annual Pattaya Classical Guitar Festival & Competition which took place on Saturday, October 29. 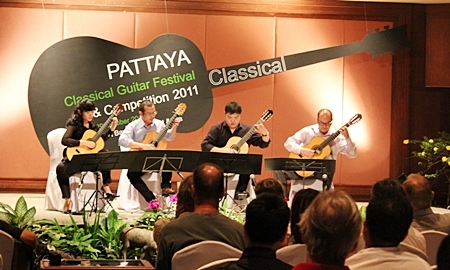 The festival is the only one of its kind in Thailand, showcasing many of the world’s top guitar makers and musicians. The event was open to the public and over a hundred collectors, players, music lovers and students attended. The festival boasted an impressive line-up of guest artists, luthiers and students hailing from America, Japan, Germany, Switzerland, Philippines and Thailand. 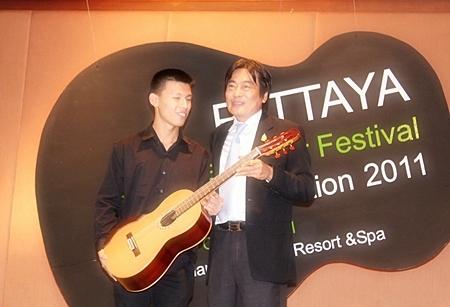 Winner of the 2011 Guitar Festival competition, Chinnawat Themkumkwun (left) accepts his prize guitar from Deputy Mayor of Pattaya, Ronnakit Ekasing. This year’s event kicked off with the adult and junior guitar competitions taking place in the morning, followed by a guitar exhibition, Thailand Guitar Society student concert, an afternoon concert with virtuoso star Hitoshi Miyashita and a master concert featuring Woratep Rattana-umpawan, Santi Kaewjai and the Wong-Kojorn Guitar Quarter. The day long festival then culminated with a spectacular evening concert that showcased the expert strumming of Leon Koudelak, Monching Carpio, Tomonori Arai and Paul Cesarczyk. The Wong-Kajorn Guitar Quartet perform at the Siam Bayshore Resort & Spa. First prize in the senior competition went to Chinnawat Themkumkwun from Thailand, who won a guitar valued at $US3500 made by the world renowned Indonesian luthier Hanief Palopo. Coming in second and third were Natdanai Phuaphanprasong and Tanist Saengwichai respectively. The precocious Chinnawat Themkumkwun also placed first in the junior section ahead of Khanisorn Theppreecha and Jatetapon Suttiprapa who were each awarded 3,000 and 1,500 baht in prize money for their efforts. Proceeds from the festival will go to the Father Ray Foundation which cares for more than 850 orphan children, street children, blind children and young disabled adults throughout Thailand. For more information, go to www.thailandguitarsociety.com. Leon Koudelak entertains the audience with a virtuoso guitar display. 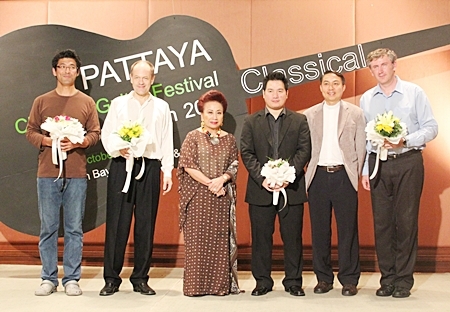 (Left to right): Tomonori Arai, Leon Koudelak, Kamala Sukosol, president of Siam Hotels & Resorts, Monching Carpio, Father Peter Srivorakul, acting president of the father Ray Foundation; and Paul Cesarczyk appear on stage at the conclusion of the 2011 guitar festival. 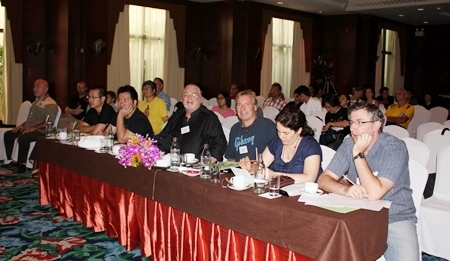 The jury members prepare to cast their vote during the senior competition.